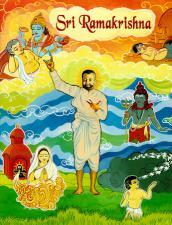 The story of Sri Ramakrishna for children in comic book format. A delightful introduction for children to the life of Sri Ramakrishna, this book is presented in an accessible, comic book form. Young readers will be taken on a journey from the birth of Sri Ramakrishna, his vision of the Mother, to his passing of the torch to Swami Vivekananda.